There are remote places on Earth where the blissful effects of civilization have left hardly any trace. Get balanced with CaliVita’s Noni products that are from such areas, where the harmony between man and nature still exists. This evergreen plant is indigenous to Poly­nesia, Malaysia, Australia and South-East Asia, and its height ranges from the size of a tiny shrub up to 10 meters. However, the versatility of its size did not earn the world’s attention as much as the unbelievably rich composition of its fruit. 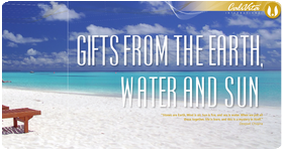 It contains 18 kinds of amino acids, includ­ing many essential ones that the body needs, but is un­able to synthesize. It is also rich in vitamins and minerals that contribute to the fulfillment of the daily demands of the body. Containing other compounds of antioxidant effects it may con­tribute to the protection of our cells against certain harmful effects of free radicals. It has a beneficial effect on the self-healing ability of the body. One of the most important ingre­dients is a giant molecule called proxeronin. From proxeronin our body produces xeron­in in the liver. It is the ingredient of enzymes, an effective supporter of cells and assists in the healthy functioning of the immune-and hormone system. There are many things that may increase the xeronin demands of the body. The most frequent effects are, stress and increased mental and/or physical strain. A certain amount of proxeronin is ingested with nor­mal food, but noni contains it in extraordi­narily large amounts. 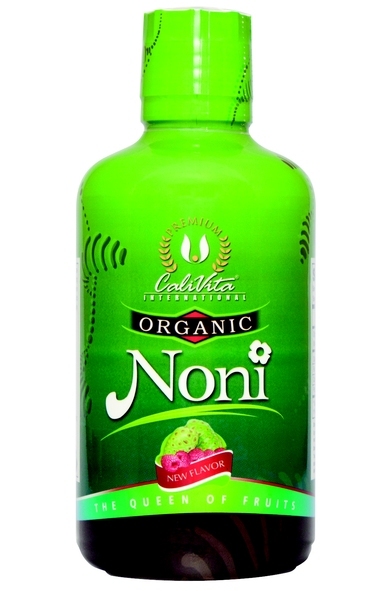 As the demand for organic certified products is significantly increasing, the popular Polinesian Noni available is made from pure organic certified ingredients. 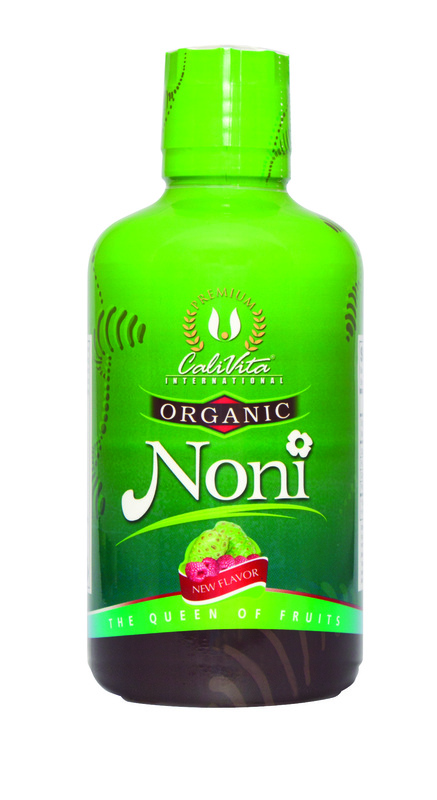 While Polinesian Noni comes from untouched nature, CaliVita Organic Noni is from controlled organic cultivation. Using the term “organic” (or bio in some countries) has been quite trendy of late. The whole “organic” business is booming and the demand has increased dramatically. Conscious consumers now prefer organic food or even clothes when shopping, but many consumers still do not know what the term “organic” stands for. Of course, the average consumer is not completely aware of the regulations and furthermore, many forums are using this term misleadingly. How can we avoid being misled? Firstly, we need to know that organic food can only be a food that is stated organic by an approved certifier ensuring the food meets the strict standards. When checking the label, it is advisable to not only look for the term “organic” but the name of the certifier as well. As consumers are more interested in the “practical” differences between organic and “regular” food we shall now take a closer look at them. Organic food is made/produced/cultivated without using chemicals such as synthetic fertilizers and pesticides. Pesticides can remain in the body and build up in the liver, and are associated with behavioral problems, growth issues, lower cognitive scores in babies, and greater risk of specific chronic diseases in adults such as Parkinson's disease and lymphoma. As for organic meat, eggs, and poultry, animals must not be treated with such veterinary drugs as antibiotics or growth hormones. Bioengineering, gene modification and ionizing radiation are also not allowed. According to some studies, organic fruits, vegetables and juices may contain more antioxidants, polyphenols, minerals, etc. compared to conventionally grown versions. Fruits produced at organic farms are more flavorful and nutritious, and according to studies, they seem to have significantly higher antioxidant properties, concentrations of ascorbic acid, and dry matter. Organic foods are usually more expensive. This is something consumers are painfully aware of and is very often the main reason for rejecting organic food. But why does it cost more? Chemical fertilizers and pesticides are “cheap” compared to the methodology that organic farmers have to follow. They need to plant certain plants, keeping away harmful plants and insects. Consequently, organic farming is harder work requiring more labour, while organic cultivation produces a lower “yield per acre” ratio. “Normal” cultivation is on a large scale and is “big” business, which means lower than average fixed costs. Organic cultivation on the other hand, usually means small and mid-sized farmers. These factors result in higher production costs. Non organic cultivation may have more negative effects on the environment. By using chemicals, polluting the air, life waters and soil, they usually do not have to pay for the damage caused to these externalities. It is a paradox that the higher price of organic products also reflects the extra costs of reducing these externalities during production. Statement: All CaliVita® products are manufactured from the highest quality natural raw materials available. We strive to avoid the usage of industrial or technological processes as well as chemicals that may have a negative effect on the product, consumers and the environment. 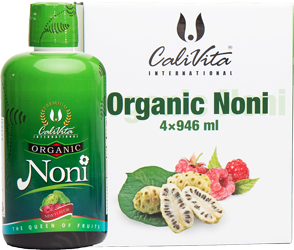 CaliVita® Organic Noni is from controlled organic cultivation, certified by Organic Certifiers, Ventura CA, USA.